While the International Space Station orbits Earth once every 92 minutes, NASA astronauts on the ISS still celebrate Thanksgiving much like the rest of the US - with turkey and football. Or at last, that's what NASA astronauts Scott Kelly and Kjell Lindgren will be doing today. The two took the time to make a video (which you can check out here), giving thanks, sharing their plans and showing us what their Thanksgiving meal will consist of - smoked turkey, candied yams, corn and potatoes au gratin. 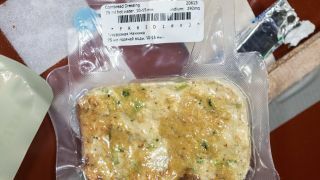 But how do you prepare this meal on the International Space Station? In another video posted to the NASA Johnson Space Center YouTube page, we get a step by step demonstration of how to prepare Thanksgiving food in space, showing us how the astronauts rehydrate a vacuum-sealed turkey tetrazzini meal - which is almost as simple as just adding water.